What Does Code P1780 Mean? Many older Ford vehicles equipped with an automatic transmission have a transmission control switch (TCS) built into the gear selector. When the TCS button is pushed, the transmission is prevented from going into overdrive. The transmission control switch lamp (TCSL) is also illuminated when the TCS button is pressed. 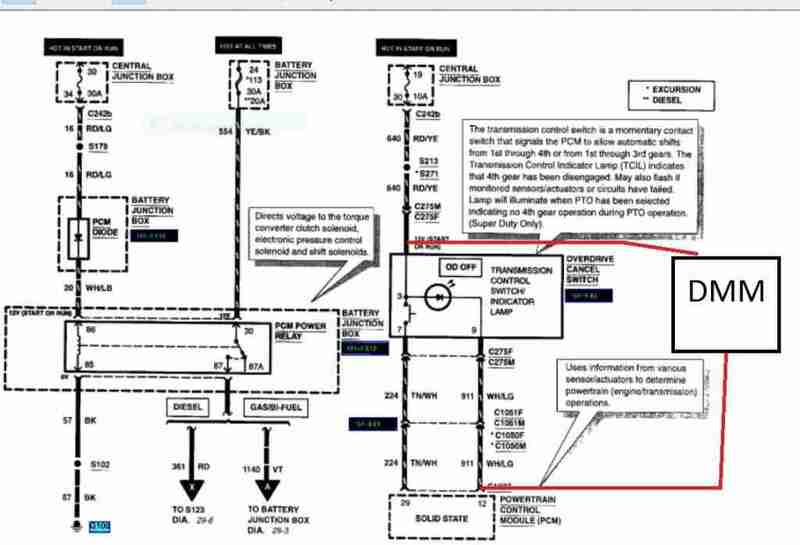 Code P1780 indicates the powertrain control module (PCM) has detected a fault with the TCS/TCSL circuit. What are the common causes of code P1780? What are the symptoms of code P1780? Symptoms associated with code P1780 may include a transmission that will no go into or come out of overdrive, an inoperative TCS indicator lamp and an illuminated check engine light. How do you troubleshoot code P1780? Start by visually inspecting the transmission control switch. Look for a damaged button, loose wiring etc. Repair as needed. Next, check for technical service bulletins (TSBs) about the concern. If no problems are found, move forward with a sequential diagnosis of the system. Refer to the manufacturer’s service information for the exact diagnostic process. Gain access to the transmission control switch connector and disconnect it. Turn the vehicle ignition on and use a test light to check for power to the TCS. To do this, connect a test light between the battery negative terminal and the TCS B+ terminal on the harness side of the connector. The light should illuminate. If it does not, there is a problem on the power side of the circuit. Consult the factory wiring diagram and repair the power side of the circuit as necessary. Gain access the transmission control switch connector and disconnect it. Then, use a test light to check for TCS ground. Connect the test light between the battery positive terminal and the TCS ground terminal on the harness side of the connector. The light should illuminate. If it does not, there is a problem on the ground side of the circuit. Consult the factory wiring diagram and repair the ground side of the circuit as necessary. Gain access the transmission control switch and disconnect the TCS from it’s connector. Then, use a digital multimeter (DMM) set to ohms to test the TCS. Connect the meter between each of the switch terminals while pressing the TCS button. According to Ford, the meter should read less than 5 ohms with the switch depressed. With the switch released, the meter should read more than 10k ohms. If the readings are not within specification, the switch is faulty and should be replaced. If the switch reads out of limits (OL) with button pushed, it should also be replaced, since this indicates an open circuit. Generally, the transmission control indicator lamp receives power from the same source as the transmission control switch. So, if the TCS how power, the TCIL should also. 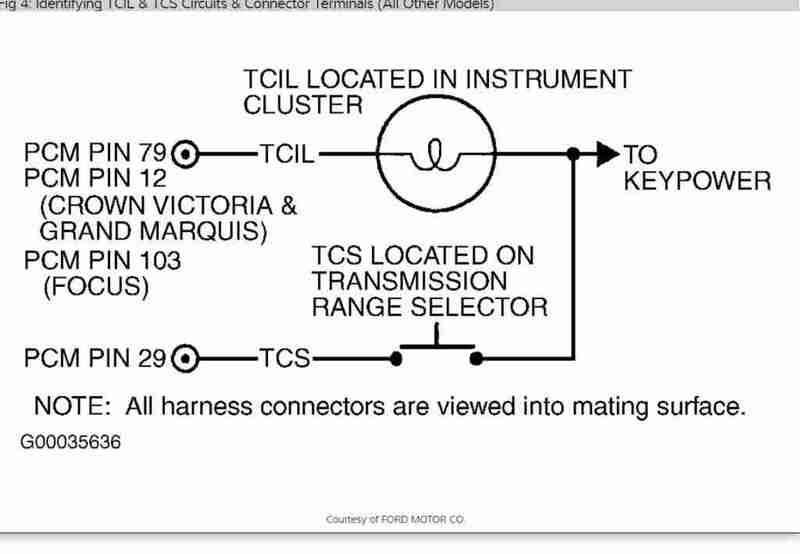 To test the TCIL circuit, disconnect both the TCS connector and the corresponding connector at the powertrain control module (PCM). Turn the ignition off. Connect a DMM set to ohms between the B+ terminal on the switch side of the TCS connector and the TCIL terminal on the connector side of the PCM connector. The meter should read a numerical value. If it reads out of limits (OL) there is an open circuit between the TCIL and PCM, or the TCIL bulb has failed. Consult the factory wiring diagram and repair the ground side of the circuit as necessary. 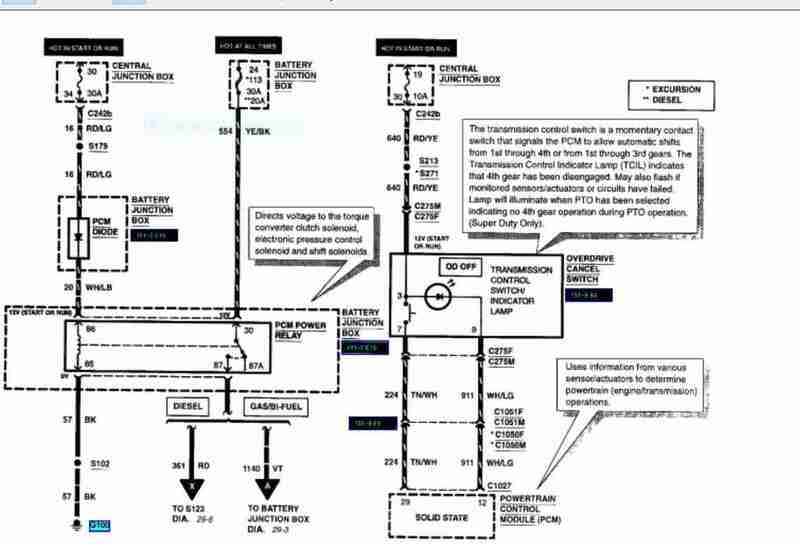 If everything tests OK up to this point, the powertrain control module may be faulty. To check PCM operation, first remove the transmission control switch/transmission control indicator lamp connector at the PCM. Turn the ignition off. Connect a meter lead set to ohms between the PCM TCS terminal and the negative battery terminal. Push the TCS button – the meter should read a numeric value. A reading of limits (OL) indicates the PCM is not supplying ground as it should. Repeat this same test for the TCIL portion of the circuit by connecting the meter leads between the PCM TCIL terminal and ground. Once again , if the meter reads OL, the PCM might be faulty. However, PCMs rarely fail, so it’s a good idea to recheck all of your steps up to this point before replacing the PCM.